The Georgia Sea Grant College Program is taking applications for the 2018 Knauss Marine Policy Fellowship, which places graduate students for a year in various executive and legislative branch offices throughout Washington, D.C. The fellowship provides a unique educational experience in the policies and processes of the federal government to students who have an interest in ocean, coastal and Great Lakes resources and in the national policy decisions affecting these resources. The fellowship period begins Feb. 1, 2018 and ends on Jan. 31, 2019. Aron Stubbins and Kevin Ryan attended the 1st IberAmericano Limonology Conference in early November where Aron gave a plenary talk and chaired a symposium, and Kevin gave a talk in Spanish. Aron’s talk was on the Pulse-Shunt Concept, which is a new concept for the cycling and transport of river carbon. This was in connection with his NSF Macrosystems grant. Kevin’s talk addressed continuous assessment of carbon cycling and transport in the Connecticut River – part of the Pulse-Shunt NSF Macrosystems project. The following week, they visited the Universidad Austral de Chile’s Coastal Research Center and their Limnological Research Center. 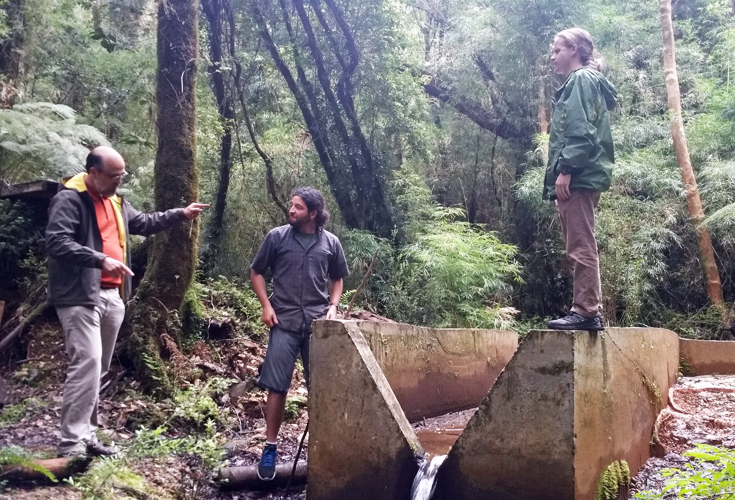 “We also visited some rivers we are studying that are being impacted by salmon farming and some streams draining native and non-native forest, that we are also studying,” Aron said. Aron also gave a public lecture sponsored by the “American Corner”, a US Embassy Sponsored program. The talk was at the Centro de Estudios Científicos (Center for Scientific Studies; http://www.cecs.cl/website/index.php/en/acerca-del-cecs) and attended by high school children, the public and local scientific community. Now-former UGA Skidaway Institute and Savannah State University graduate student Ashleigh Price had a November she won’t forget. On November 8, she successfully defended her master’s thesis before her committee and a public audience. Ashleigh at her dissertation defense. She officially received her degree on December 10. Ashleigh did most of her research as part of Marc Frischer’s lab at Skidaway Institute. 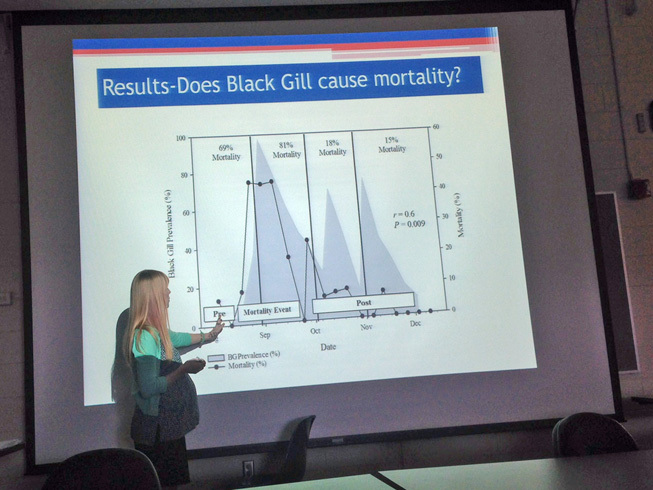 The title of her thesis was Environmental Reservoirs and Mortality Associated with Shrimp Black Gill. To cap off the month, Ashleigh gave birth to her daughter, Astra Jean Visconti at 7:10 p.m. on November 30. 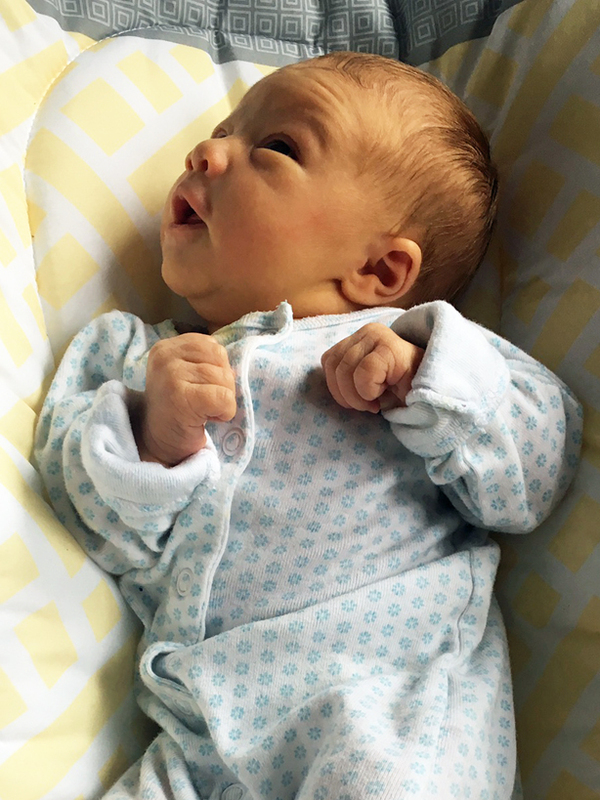 Astra came into the world at 18.5 inches, and weighting six pounds and 10.6 ounces. Mother and baby are both doing well. Registration is required one week prior to any program. For more information or to register, contact Kayla Clark at kayla270@uga.edu or (912) 598-3345. 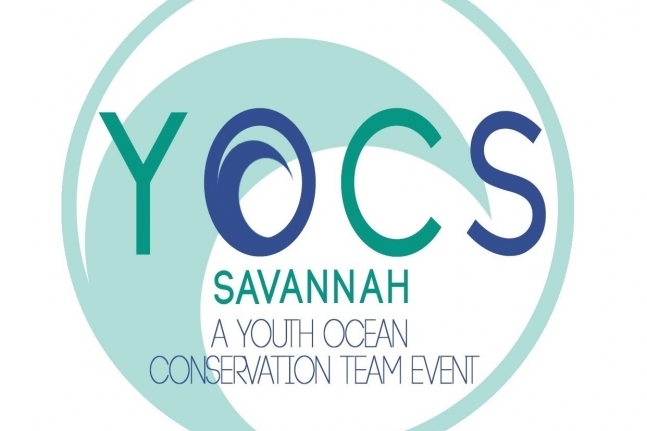 UGA Marine Extension and Georgia Sea Grant is hosting Georgia’s third annual Youth Ocean Conservation Summit on Saturday, Jan. 28, at the Marine Education Center and Aquarium on Skidaway Island. This summit, one of several taking place across the country, empowers students with the knowledge, skills and resources necessary to successfully implement ocean conservation projects. The event will include skill-building workshops, brainstorming sessions, citizen science presentations and panels featuring professionals working on coastal issues in Georgia. At the end of the day, students will work together to develop and present ideas for conservation efforts that they can lead in their local communities. The event is being organized by the 2016-2017 Georgia Sea Grant Marine Education Interns Kira Krall, Hannah Kittler, Hannah Edwards and McKenna Lyons. Online registration is open now and closes Jan. 18. The summit is limited to 50 students on a first-come, first-served basis. A $10 registration fee includes lunch and all materials. To register, complete the online registration form and payment. For more information, visit the Marine Extension and Georgia Sea Grant website http://marex.uga.edu/yocs/. Moviegoers gave rave reviews to the Gray’s Reef Film Festival’s first-ever “3D Night” last year, spurring Gray’s Reef National Marine Sanctuary to offer two consecutive nights of 3D fun for the upcoming festival. The sanctuary also is expanding the event’s reach by adding a daytime showing at the Tybee Post Theater. On tap for the 3D showings at the Trustees Theater Feb. 3-4 are “Galapagos 3D: Nature’s Wonderland,” “The Last Reef 3D,” “Wonders of the Artic 3D,” and “Secret Ocean 3D.” “Galapagos 3D” is directed by award winner Martin Williams, who is well known for his documentaries with David Attenborough. “The Last Reef 3D” was shot in five different countries and is the production of Academy Award nominees Luke Cresswell and Steve McNicholas, while “Wonders of the Arctic 3D” is a sweeping film by David Lickley, who describes himself as a “wilderness environmental-themed filmmaker. “Secret Ocean 3D” is a beautiful jewel of a movie by Jean-Michel Cousteau. 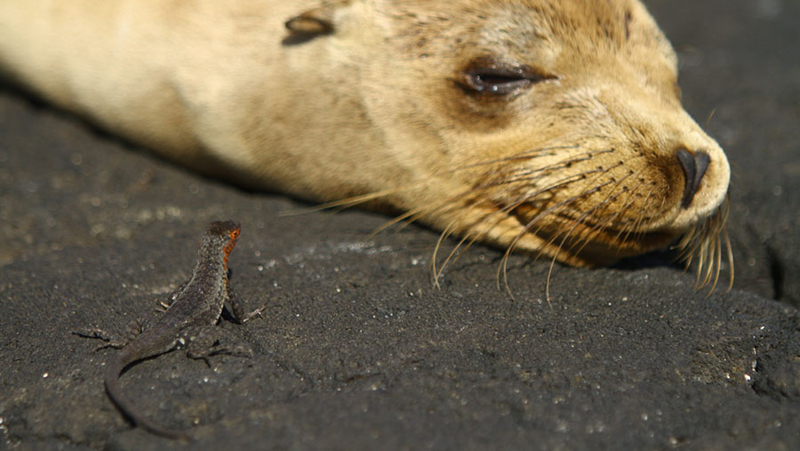 The Tybee Post Theater offerings on Feb. 5 will include a delightful sampling of films from the San Francisco International Ocean Film Festival, the premier venue in North America for ocean-related movies, most of which are largely unavailable to the general public. Like last year, Gray’s Reef suggests a donation of $10 per day for adults, $5 per day for children, students and military, to benefit the Gray’s Reef National Marine Sanctuary Foundation. 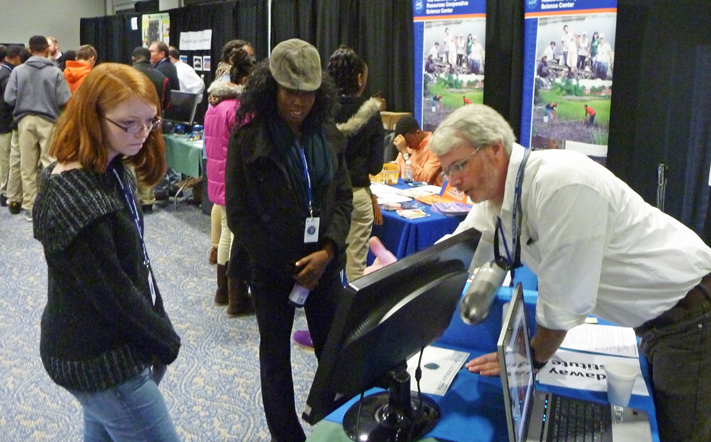 Mike Robinson demonstrates GIS to two visitors. The Alexander lab participated again as a sponsor with the GIS Day Savannah event hosted by Savannah Area Geographic Information System (SAGIS) on the Savannah State University campus. This year marked the 10th year for the event which introduced 450 8th grade students along with area business owners, staff, GIS users, and citizens from the local community to demonstrations of real-world applications that are making a difference in our society. GIS Day is celebrated internationally as part of National Geographic’s International Geography Week. The National Geographic Society has sponsored Geography Awareness Week since 1987 to promote geographic literacy in schools, communities, and organizations, with a focus on the education of children.